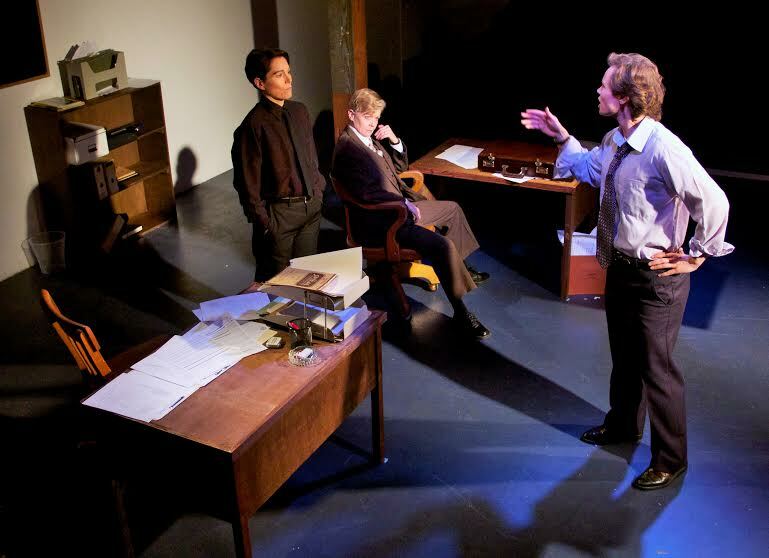 What a great opening, for both this all-women production of Glengarry Glen Ross by Classic Chic Productions, and the Beaumont Stage space (be sure to check out Beaumont Studio some time too, which has some very interesting artists in house). Many attendees might know the 1992 film, which is legendary for its powerful all-star cast. David Mamet wrote both the 1984 Pulitzer-Prize-winning play (which was a sensation on Broadway) and then the screenplay, and the play is by necessity more abbreviated. But if you know the film, you’ll undoubtedly recognize many of the legendary scenes. Glengarry Glen Ross is something of a period piece. There are no cellphones, which would have changed the plot a fair bit. Online databases might be easier to steal than paper ones, but require different strategies. Has the essential psychology of boiler-room scam sales changed, though? I suspect not. David Mamet based the play on his experience as an officer manager in a similar real estate office in 1969. As grim as it is, there’s nothing implausible about it. The office set looks just like you would expect an early 1980s real estate office specializing in Florida swampland to look. The actors have to dress the part of old-style salesmen, and the costume design hits the mark. To see these transformations, just take a look for some of the actors’ standard publicity photos compared to how they appear in this play–the combined effort of all the theatrical staff to make these characters look and act the way they do is stunning. When I think of Mamet’s theatrical works, I tend to think of almost unremitting grimness. That is certainly true of Glengarry Glen Ross, but this production sparkles throughout regardless, and the texture and tempo of the grimness changes constantly. The actors skillfully extracted numerous laughs from the audience. Is it ironic that such a stereotypically masculine play is being acted by a troupe of women? I think you will find that you forget the gender of the actors when you watch this play, as they fully embody their roles. I have seen this happen before in other plays (including when Classic Chic Productions did The Winter’s Tale last year), but I am always stunned in retrospect about the power of the characters and the power of the actors to create an alternate reality. Classic female status-seeking and oneupmanship (an ironic term in the context) can be seen in films like Mean Girls (admittedly that is about teenagers, not the middle-aged). In Glengarry Glen Ross, seeing women vie for status as men would do calls attention to gender stereotypes about these cruel behaviors. 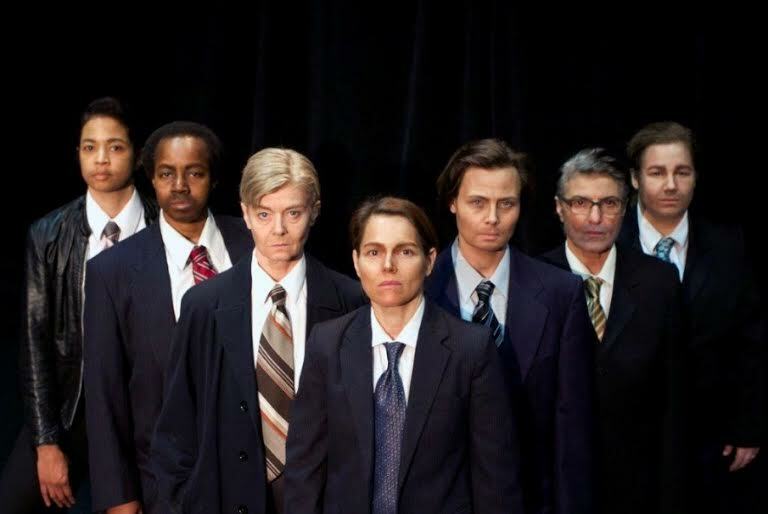 As with other Mamet plays, the way each actor physically embodies the character and lives his reality is extremely important as to whether the play resonates. Each of the actors demonstrates natural body language that reflects the character. Ricky Roma, vying for #1 spot and a Cadillac, throws open his legs and puts his feet on his desk in a completely easy fashion. Of course, being masculine does not just mean being an alpha power-seeker. James Linghk is mousy, subject to flattery, and attempts to shrink away rather than offend the sociopath who sold him Florida swamp land, but the character is indubitably masculine nonetheless. Shelly Levene demonstrates the art of keeping a calm, impenetrable surface over raging doubts and insecurities. Williamson, as office manager, is denigrated constantly by the salesmen who see themselves as superior, only to be fawned on occasionally when they desperately want a favor, and the actor’s facial expressions are masterful at conveying Williamson’s internal satisfaction in seeing through the facades of his fellow employees. Although I have seen various productions of Glengarry Glen Ross over the years, and there could not be any plot surprises, I was amazed at how the dramatic tension still held me. Mamet is a master at drawing out suspense, and the actors work well with it. The play is about grinding degradation and competition in pursuit of material goods and status. I found myself thinking of Michael Lewis’s 1989 book, Liar’s Poker, which is based on Lewis’s experience as a Wall Street salesman of poor-quality bonds in the 1980s, in an environment which may have been higher class, but scarcely more reputable. Shelly Levene, in particular, reminds me of Willy Loman in Arthur Miller’s Death of a Salesman. One major reason this play resonates is because we (the audience) know that we are subject to continual cons all the time, whether it be marketing for harmful or unnecessary products, or the latest political shenanigans and scandals. By making the con so stereotypically obvious (Florida swampland), we can better focus on the mechanisms of the con.